User review of the month, November – Wharfedale Diamond 220 | What Hi-Fi? A bargain pair of budget Wharfedale speakers made one reader happy this month. This month's winning user review shows you don't have to be constantly chasing the newest, shiniest piece of kit to get your money's worth. In fact, one of the best things about hi-fi is the longevity of good quality products. The best speakers and electronics will stand the test of time, at least when it comes to audio performance. That said, we're not going back decades here, merely a couple of years, with the Wharfedale Diamond 220 speakers, which launched in 2014. Reviewed at £180 and now available for £149 at Richer Sounds, the Diamond 220 speakers are still a bargain according to one reader, matthewpiano. And he wins a pair of Lindy Cromo NCX-100 noise-cancelling headphones worth £100 for sharing his thoughts with the world. "Naturally balanced Diamonds" is how he describes them in his review, delivering an "open and airy" treble alongside a focused midrange and "tight and tuneful" bass. 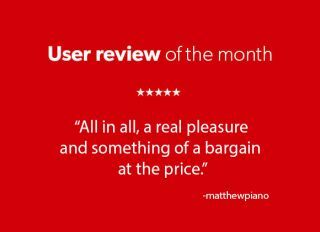 Each month we'll be picking a winning review, simply write your own review to be in with a chance of winning the competition. Every user review published in December will be considered. Need some inspiration? Look back on previous user review of the month winners, which have featured an Arcam amp, a Denon system, B&W speakers, a 4K OLED TV and Rega turntable.